A good burger is about as American as you can get in terms of food. With farm-raised beef and organically-grown ingredients, Maine has some delicious juicy burgers that will leave your mouth watering for more. Next time you’re craving some beef between two buns, order a burger from one of these top places in Maine. Nosh is famous for their creative and somewhat crazy burgers. If you’re more traditional then the cheese burger will meet your needs. But, if you’re willing to try something a bit different, the Burnt Trailer Queen or The Slab Burger are fine choices. Nosh only uses beef from all-natural cows who are pasture-raised in Nebraska. The Nocturnem Draft Haus is a high-end bar that serves up some pretty epic burgers in Bangor. Choose from four different charbroiled Angus burgers. We recommend the Nocturnem Burger, made with Chimay cheese and caramelized onions. Pair it with a stout on tap. After a long day of skiing, refuel at The Bag & Kettle Brew Pub on Sugarloaf Mountain with a delicious hard-to-fit-in-your-mouth burger. Choose from five different “gourmet designer burgers” with names like Gucci, Dior, and Armani. If you don’t want beef, try the Dixie Chicken burger topped with melted Swiss cheese. Owls Head General Store, opened seasonally in Owls Head, is home to “Maine’s Best Burger” according to the Food Network, Village Soup, and the Down East Magazine. The Sevens Napkin Burger is certainly worth the trip up the coast. The beef patty is topped with cheese, mustard, mayo, ketchup, pickles, tomatoes, lettuce, and onions. Good luck fitting it all in your mouth! The Fat Boy Drive-In is an iconic Brunswick eatery that’s a blast from the past. Every year tourists and locals flock when the restaurant opens in the spring. Choose from a classic hamburger or cheeseburger for just $2.50 or double the fun with their Whoperburger, four ounces of burger topped with lettuce, tomato and their own sauce. Located in an old train car, the Palace Diner is throwback to yesteryears when diners were king. This diner still is as you’ll meet loads of locals enjoying their morning coffee or a delicious diner burger for lunch. For $14 you can order the Palais Royale, which is a double burger with cheese, iceberg lettuce, pickles, mayo and mustard. Fries come on the side. Formerly known as Rudy’s of the Cape, the Bird Dog serves up some yummy American fare with a side of creativity. Ingredients are sourced locally and used widely in dishes. Their famous Bird Dog Burger is cooked in a controlled vapor oven giving it the perfect mix of juiciness and taste. It is then topped with bacon, cheddar, caramelized onions, lettuce, and horseradish aioli. Opened in May 2008, the Thistle Pig uses locally sourced meat from Breezy Hill Farm. While you may have a hard time choosing something on their delicious menu, the grass-fed beef cheeseburger on brioche is a fine choice. The burger is served up with America cheese, crispy fried onions, spicy pickles and their special burger sauce. This quirky little bar and café has a fun atmosphere, friendly staff, and a great menu. The grass-fed beef burger is a great find for $15. The burger is topped with Sriracha onion rings, bacon jam, Asiago cheese and completed with a toasted Brioche bun ready for the perfect first bite. Enjoy with a side of duck dusted fries. Yum! Grace is one of Portland’s prettiest restaurants set in an old church. 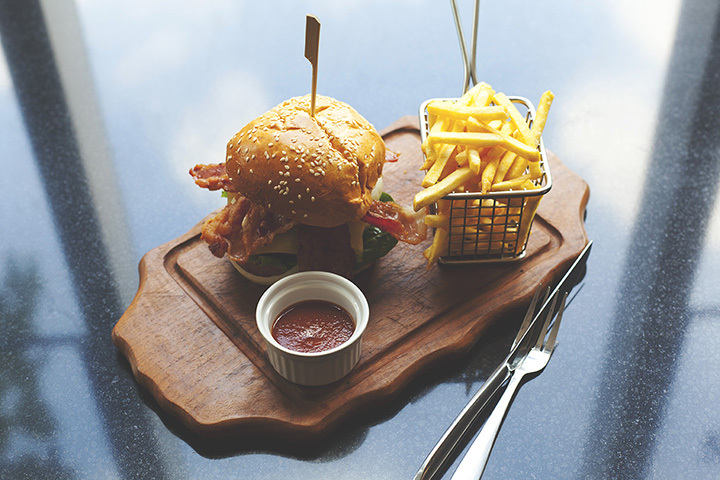 Included on their “Bar Snacks” menu is a delicious and budget-friendly burger. The Grace Burger is only available at the bar or in the lounge so it should be paired with a beer. The burger is topped with cheddar, tomato confit, and pickled onions. It may be simple, but’s delicious.